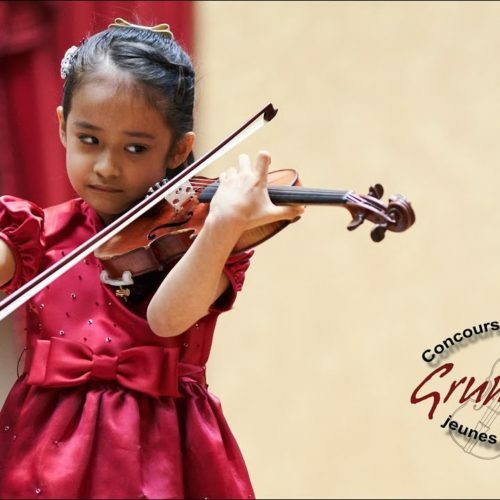 Himari Yoshimura from Japan won 1st Grand Prize playing Paganini’s first concerto at the International Grumiaux Competition this week in Brussels, Belgium. We could not possibly comment. Okay, here’s a comment. Himari, who last year won 1st. Prize in the Leonid Kogan Competition for Young Violinists, in fact here won the Grand Prize in the 10 years and younger category. First Prize in this category went jointly to an 8-year-old Bulgarian/Japanese and a 10-year-old Vietnamese. In the main category, 21 year-old Ayaka Uchio won 1st. Prize. More facts to be found on the Grumiaux Competition website. Abs Astonishing! I can’t wait to hear her in 10 years time. Freak show and exploitation. Is there no shame left? Why automatically assume the worst? What is ironic is that you are calling this out for “exploitation” while simultaneously calling a 7-year old girl a “freak show”. What say you of Leopold Mozart? His boy turned out ok.
Haha! Did he indeed? Read his letters sometime. Do you really UNDERSTAND what EXPLOITATION means? I think you are dumb if you think this girl is being exploited! She is phenomenally talented and is having fun doing what YOU obviously cannot do! Wow, But she’s not the first to be this talented and she won’t be the last. I hope her parents aren’t treating her in the same way Mozart’s Dad treated Mozart. But I guess they are, just to show off how much more better she is than other people’s children for their own selfish ego’s. ” …just to show off how much more better she is than other people’s children for their own selfish ego’s.” Since you don’t actually know what is in the minds of her parents, you are telling us what is in your mind…and it ain’t pretty. what in the world for ? … after first becoming a well rounded young woman, after having a reasonably normal and happy childhood, filled with the joy of music making and lots of pure, unstructured play. Born to play violin…that is amazing. What strikes me here is her fluidity, remarkably relaxed through even the most difficult passages, & authentically sensitive phrasing. And the expressions on her face – simply pure love for music – brought tears to my eyes.. This one really is something special I think. Bravo to those influencing her who are allowing her to keep that. I hope it lasts forever. She is hugely talented and extremely accomplished for her age – that is obvious. But I fail to see the point of letting such young musicians compete, no matter how good they are. Musical competitions are questionable enough for adults. For children they are little short of evil. Competitions are a malignancy in the corpus of music. The entire concept of a competition is antithetical to art. Having a 7 year old daughter who is playing the violin, I think she is amazing! I looked up her website, and not only does she play the the violin, but she does Karate, and accomplished in other things as well. I think it’s just mean spirited to call this a result of exploitation. I know there is no way your own child will play the violin this well even if you exploit her/him. She is just brilliant and just take that reality. This is incredibly impressive, however, even if you are a genius which she probably is, it still requires a tremendous amount of work hours. I just wonder why it is necessary to work such young children so hard so early. There is plenty of time to develop and it should be done naturally, within the comfort zone of a child. How long can one sustain such mental and physical discipline before they burn out. Who knows, that could be within her comfort zone and I wish her all the best!